‘Woo hoo’ Hayden whoops as the wind slams the side of the tent. I am lifted up off my sitting, bracing position and pushed forward. I fight back, trying to keep the tent poles in place. The wind abates and just as quickly I am repositioned back on the ground. ‘That was a strong one’ he says in the brief lull. My job involves taking novice students into the mountains for 30 days and teaching them the technical, leadership, and decision making skills to go mountaineering. Usually we do mountaineering type activities. Ideally these activities include climbing mountains, learning snow and glacier travel skills as well as practicing and implementing the requisite technical skills and judgement. One way that we have fun assessing students’ development and mastery of these skills is through a technical skills Olympics. These often take the form of relay races where students tie knots, coil ropes, and perform other skills such as rigging a rappel or building an anchor. It occurred to me though, while kneeling in a tent on a cold, wet, windy night, hands outstretched and arms aching in the bracing the poles that in reality those skills are all secondary to the mountaineer. What really matters is fighting the good fight. What we should really test instead are the Hunker Games. So here, in no particular order are the skills one needs to hunker well. Snow Wall Building: Yeah, high is good, but height without support at the base just becomes dangerous and wasted work in the wind. We are talking tuna cans here, wider than it is tall. Quickness, as usual, counts for something. Can you cut a decent block with a shovel? Bottle Peeing: Can you do it lying down in your sleeping bag? Extra points go to those without external plumbing and those who don’t carry a dedicated pee bottle, but there is a distinct loss of points for using the cook pot or other group gear. Your own boot shell is fair game and doing this while effectively bracing a tent (#4) can cause a dramatic increase in style points. Frozen Rope Tricks: When the rope goes straight out of your hand with no help from the wind, coiling is always a challenge. Mittens, a frozen rope and tying a figure eight equals expert status. Besides if you fail at all the others, then you probably need to rope up and get the heck out of there. Jumping ship or bailing, call it what you will, if you gotta go, you gotta go. 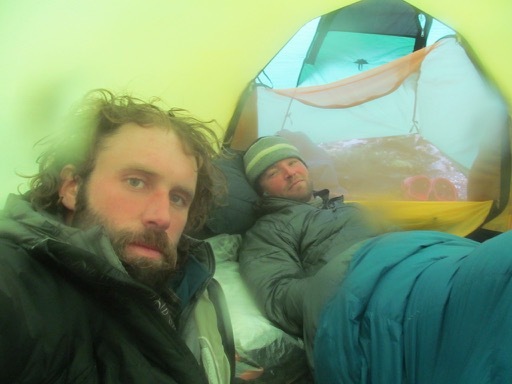 Tent Bracing: Since hunkering doesn’t usually happen in good weather, hunkerer’s often lie in sleeping bags. Despite the best wind walls (see #1) wind often creeps in and hammers the tent, the poles bending inward, even on the best designs. Going quickly from supine and cocooned in a mummy bag to bracing a tent wall is an especially useful skill. The initial head and foot brace (head on one pole, cocooned feet on another) is useful but not very sustainable. Champion bracers go from supine to fully braced against the wall quicker than one can curse Njörðr [Ne-yord](the Norse God of Wind). With enough people, the sitting brace, back agains the pole, can be efficient and effective, but this can be hard if other mates are digging out (see #5) or tightening guy lines (see #6). Props to those who can effectively sleep in the bracing position. Digging Out: This could be played as a team or individual event. If other mates are in the bracing event (which inconveniently enough are often run simultaneously) this is a solo struggle. The goal: from the sleeping bag, dressed (with boots), out of the tent, clear snow from around tent faster than it accumulates and returned to cocooned sleeping bag position. If there is a vestibule all wet layers must be shed in the vestibule and cannot be worn into the sleeping bag. Guy Line Tightening: Not all that different from digging out (see #5), this activity requires one to quickly and efficiently exit the tent, tighten all guy lines and return to the cocooned position inside the tent. This can be combined with digging out (#5) for a duathlon event. Team play is entirely appropriate. The Snow Kick: When you awake (see #8) to an eerie silence and stillness, wrapped securely inside the warmth of Her Fluffiness, arms trapped by a #8 YKK zipper, you must always figure out if the silence engulfing your world is due to a starry night and incoming high pressure system or simply due to muffled sounds. A swift lift of the legs to kick the tent walls often gives the answer. If, in true hunker fashion, the kick is followed by a soft slide and then the soft tinkle of snow on the fly, the participant must continue to get the snow off all aspects of the tent. The initial kick often elicits a similar motion from tent mates. A true champion kicker can clean all parts of the tent of snow without removing his or her trapped arms from the sleeping bag. The kicker may use their head and may combine forces with their mates. This event is often followed by the digging out event (#5). Sleeping: Being able to sleep. Five days in a tent with no activity. An elite hunkerer can sleep upward of 15 hours a day for days on end and not feel consumed by mind numbing boredom (see #10). One just falls asleep and lets the dreams take them away. True masters balance this narcolepsy with a hair trigger that allows them to be up bracing the tent in anticipation of the wind (#4) and a dream triggered snow kick (#7). Mind Numbing Boredom: When the Hunker Games reach the critical stage, the days in the tent pile up end on end and the labels and hang tags have all been read, that is when mind numbing boredom (MNB) sets in. A two person team, that is where the true challenge lies. Three or more people make for more options, more diversions. This is a hard skill to test for, but new partners or old partners there is no advantage. Knowing each other’s quirks and habits has its advantages, but so does not hearing the same stupid story or dumb joke for the 101st time. MNB has been know to cause at least one death and the dissolvement of many more climbing partnerships. When all else fails, diversions can be found in the Hunker Games. Snow Cave Digging: When you do not medal in tent bracing, guy line tightening or digging out you better have a world class snow cave digger on your team. In true mountain fashion a good hunker session is not complete without digging a snow cave due to inability to maintain the tent. Extra points for fancy rooms, beds and tables but automatic disqualification for leaving the shovel outside of the cave. Once again, this time below Jagged Col, I sit bracing the walls of the reliable Hilleberg tent. I reflect back upon my years in the mountains and try to recall the last time I have had to put so much effort into hunkering, into kicking at the darkness till it bleeds daylight. Once again, the wind roars down valley, turning Jagged Stream into a wind tunnel. I reach into a stuff sack, grab a notebook and pen and between gusts, start writing a list of ways that one can be a good hunkerer. As the wind winds up and does its ghostly slam dance with the side of my tent, I drop my paper and pen, dive for the bending poles and push them backward. From the corner of my eye I see Jorn’s arm swiftly emerge from Her Fluffiness and hold the tent wall above his head. As the wind dies down the arm disappears and he returns to his masterful sleep. Next Post This is Me. . . or is it?